McCarty 594 HB II | Northeast Music Center inc. 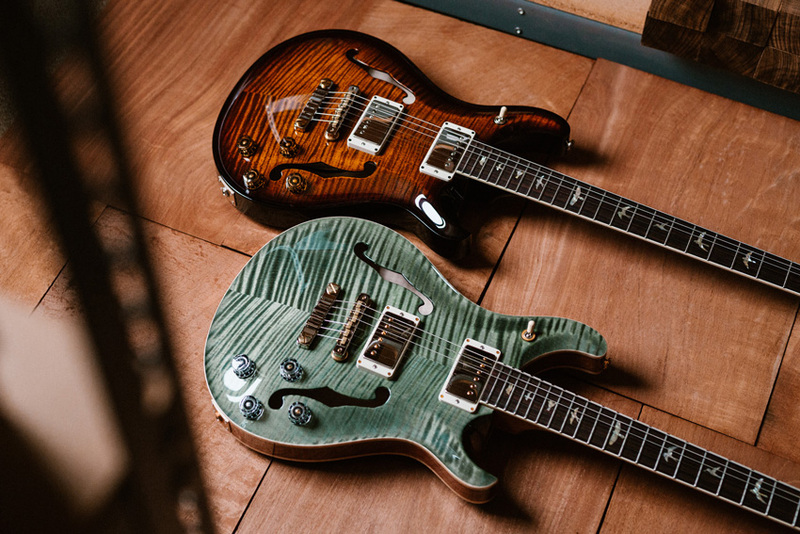 The McCarty 594 Hollowbody II joins two of PRS Guitars most beloved models. Starting with the Hollowbody II platform, this guitar features fully-hollow build construction, making it a resonant guitar with warm, woody tone. 58/15 LT (low turn) pickups add to the organic feel of the guitar while keeping the tone clear and musical. The single coil settings are especially transparent and paired with the hollow body construction, create an almost acoustic quality to the guitar. The details taken from the McCarty 594 model impart old-school character to this already classic instrument. Those details include a 24.594” scale length, two-piece bridge, tweaked Phase III tuners, Pattern Vintage neck shape, and the control layout. With dual volume and push/pull tone controls, the tonal options are vast with both rich humbucking and sweet single-coil sounds available. Additional specifications include a figure maple top and back with mahogany middle and a 22-fret mahogany neck with rosewood fretboard and “old school” bird inlays. “The Hollowbody II is a cherished model that quickly becomes the favorite among its owners. Blending the McCarty 594’s qualities into that platform accentuates the Hollowbody’s organic, woody, warm, vintage character. The bridge, scale length, and control layout add to the experience, making it completely addictive to play” - Judy Schaefer, Director of Marketing at PRS. A Special Wood Library Run of McCarty 594 Hollowbody II Guitars are due at Northeast Music Center in Summer of 19.